You have requested help with "Чародеи" and we are ready to help you! Clear your web browser's cache. There might be damaged files in the cache, which causes troubles with game loading. It is a common recommendation, to clean the cache, but it is surprisingly often helps people get back into the game. Also we recommend to decrease load of your internet connection and check the equipment (network adapter, wi-fi router, switch or other). How to save a log? Taking a Log of your game will help us to diagnose issues with your game. This is easy to do! But please take the log before reloading, while the error window is still showing or we will not receive the necessary data. 1) Click anywhere on the game screen and type: waw. 2) A small black Utility Window will appear in the upper left corner of the game window. 3) Hold the ALT key on your keyboard and click the "Sv" button in the top right of the black Utility Window. 4) This will open a window where you can save the log file on your PC. 5) Send the log file to Support or PM it to one of the Community Helpers. How to get the spell? How to use the spells? - Click on the shmoo or the building you would like to charm to put a spell on it. 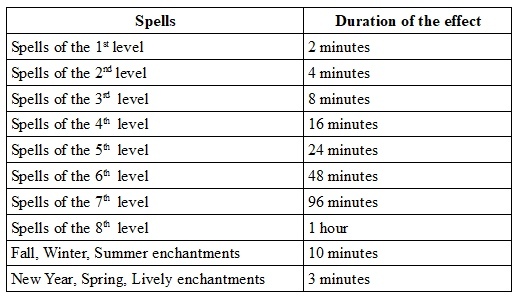 Which bonuses do you get casting a spell? 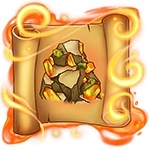 - A spell cast on the building: reduces production time; gives Gold, Magical experience, a resource drop randomly; increases amount of Gold, experience and resource that is in production. -A spell cast on the shmoo: gives Magical experience and a resource that drops randomly. How do the spells differ from each other? 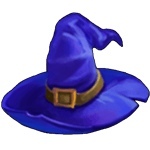 All the spells crafted in the Tower of Magic reduce the time of your buildings production and increase the reward. The more advanced spell is, the more powerful effec it causes. Moreover, there are seasonal enchantments which give even more bonuses. What is "The Transformation" ? "Transformation" is a special spell which usually appears in the events. "Transformations" are used to turna an ordinary object (a tree, a weed, a bush, a stone) to another object neeeded for a particular task in the event. "Transformation" cannot be applied to the shmoo, buildings and seasonal objects on your lands. How to complete your building? - Check the list of required resources which you need to have (will be opened in the new window). - Click "Complete" and wait until the building is completed. - Get them as a gift from your friends. How to buy a Pigfly? - Build the "Pigfly Nursery" and the "Pen". 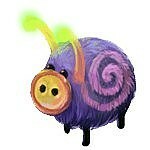 - You can buy a "Pigfly" in the Store or get it for free while collecting the income from your "Pigfly Nursery". - Check the tab "Inventory" --> "Harvest"--> choose the "Pigfly" and put it in the "Pen". How to bring up and sell a Pigfly? You can only sell Animals that are fully grown. Click the "Actions" button shaped like a hand and choose the $ sign, then click on the animal you wish to sell. Where to find a Dragon Pen? You can purchase Dragon Pens with Rubies in the Store > and purchase a “Fireproof Pen with Good Deed Tokens in the Trading Tower. How to feed a Dragon? When does the Dragon grow up? 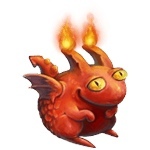 Dragons are fully grown on thew 15th-20th level (depending on the type). You can sell them after it reaches the fully grown level and get an "Element" of a particular colour. You can also keep on feeding the grown-up dragon and get its "Scale". What shall I do when the plant withers? If the plant on your garden bed withered, you can either water it or root it up. 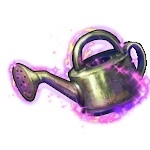 You can root any plant up for mana or water it with the "Magic Watering Can". Moreover, it is possible to agree with your neigbours on watering ot rooting up your plants. When does this or that plant wither? Each plant has its own withering time. 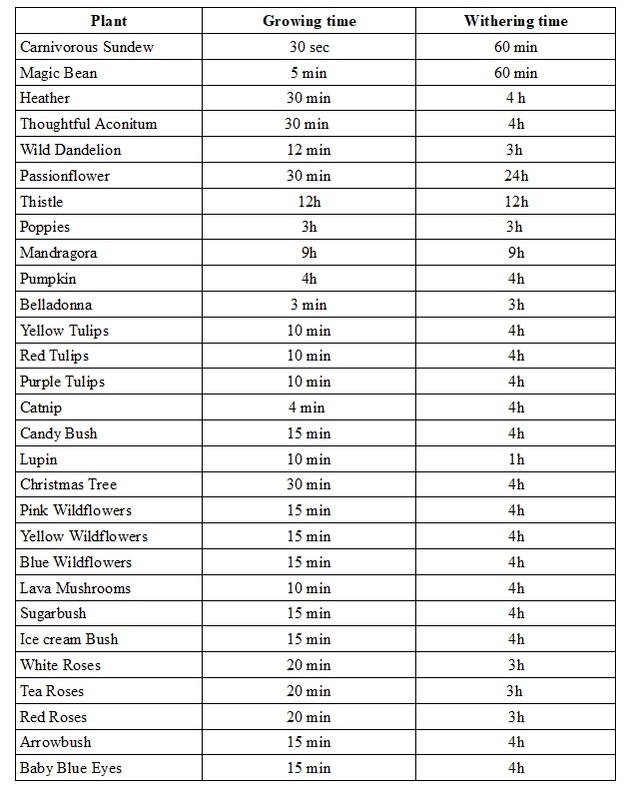 You can see the timer when the plant is grown. How to have more shmoos? 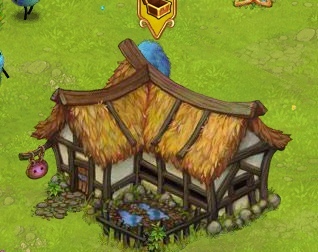 Buy and make the buildings (Shacks, Huts, Luxurious House, Manor, Cabin, Clay House). 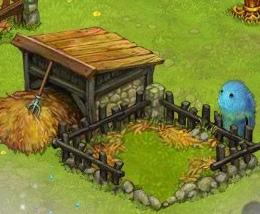 You can build up to 3 houses of each kind; Cozy Shack, Cozy Hut - 1 house each. How to send a gift? Choose a neigbour you want to send a gift to on the lower bar. 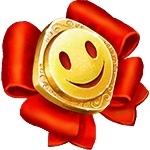 Point a cursor on his or her avatar and click "Gift". 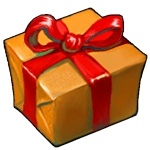 Choose a gift in an opened window and click "Send a Gift". 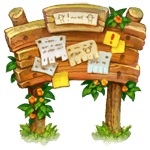 A social network may also ask for permission to send an announcement to the player. How to send a request to your friends? 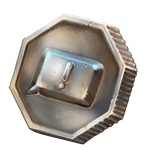 If you lack any resources for building or crafting, you can always use the button "Ask". Choose a friend whom you want to ask for the resource in a new window and confirm your choice. How to express your thanks to your visitors? If you want to express your gratitude to those who helped you on your land, you can use a new heart-shaped button in the game bar. Clicking on the bar will show you the people who have visited your lands in the past 2 days. The first in the list are those who have helped you recently. 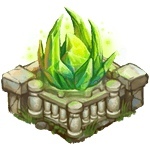 Mana - Plants (when harvesting), the source of mana. Lumber - The trees, the Woodlot. You can also recieve it as a gift. Clay - The Quarry, the stones. Rocks - Stones, the Mine, the Quarry. You can also recieve it as a gift. Magic Dust - The Spells, performing actions at your neigbours'. You can also recieve it as a gift. Shovel - The Spells, Shacks, Huts, Luxurious House, Clay House, Forges. You can also recieve it as a gift. 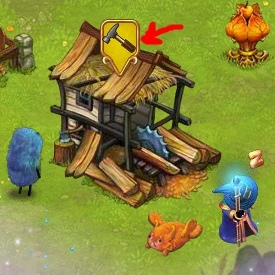 Hammer - The Spells, Shacks, Huts, Luxurious House, Clay House, Forges. You can also recieve it as a gift. Saw - The Spells, Shacks, Huts, Luxurious House, Clay House, Forges. You can also recieve it as a gift. 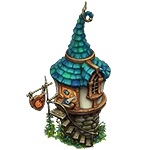 Nails - The Spells, Shacks, Huts, Luxurious House, Clay House, Forges. You can also recieve it as a gift. Frog - The weeds, the bushes. You can also recieve it as a gift. Belladonna - Crafted in the Laboratory. Lens - Crafted in the Laboratory. Agaric Mushrooms - The mushrooms and you can also receive it as a gift. Bones - Drop from the Ruins on your land. You can also recieve it as a gift. Ink - No one's Hut, Witch's Hut. Leather - Drop from feeding the animals on your land. Bricks - Crafted in the Laboratory. Scroll - Crafted in the Laboratory. Poison - Crafted in the Laboratory. Book - Crafted in the Laboratory. Weird Compounds - Crafted in the Laboratory. Paint - The spells and friendly gifts. Grapevine - The trees. You can also receive it as a gift. Solt - Drops from Mine and stones (at your neigbours' too). 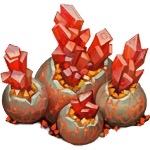 Gems, Rocks, Paper, Firewater, Knowledge - Drops from the buildings at your neigbours' even if you don't have the required for craft buildings on your own lands. Tulips - Can be crafted in the Greenhouse. Trovants - Can be crafted in the Greenhouse. I have 300 mana but want 400. What should I do? 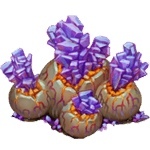 How can I increase mana supply? 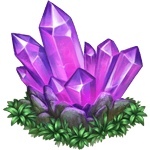 To increase the amount of mana you need to build a Druse of Concentration (increases limit of mana on 300) or a Crystal of Concentration (increases limit of mana on 100). What is experience? How can I increase the level? You can increase your experience by performing any actions on your lands and at your neigbours'. When you complete a quest, you gain a lot of experience at once. Experience is needed for increasing your level. The higher your level is, the opportunities you have! Many of the adventures are available for the players who have 18+ level. What if I am asked of more mana than I can accumulate? How can I do it? Build a Druse or Crystal of Concentration. 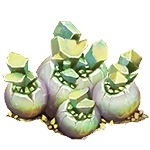 They will help increase the amount of mana you can save up. What is magical experience and what do I need it for? 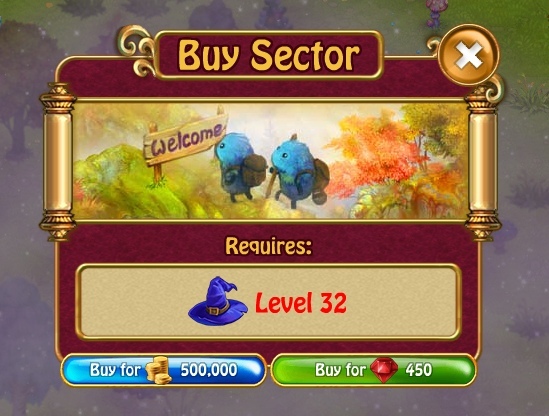 Magic XP opens an access to some buildings and gives an opportunity to buy new territories in the Magic Forest. 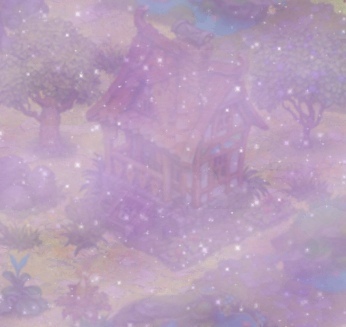 Click on the building to see how many Magic XP you need to open it. -Feeding special animals at your neigbours lands. - Accept your neigbours' help on your Market. 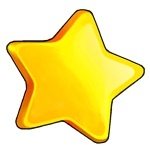 - Post a link "Gifts for everyone!" 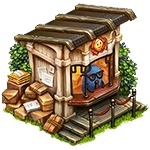 - You have a chance on getting the rubie by opening "Jewelry Box", "Boxes", "Packages" and "Friendly Gifts". The Quarters drop with a chance when you perform any action on your land. Necessary condition: you should have a Billboard on your land. 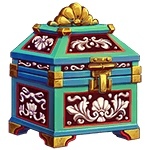 What items can be found in the Jewelry Box? Magic dust, Saw, Hammer, Shovel, Nails, Nectar, Grapevines, Seeds, Agaric mushroom, Frog, Bones, Clay, Spells, Premium energy, Magic Watering Cans, Rubies, Pigfly, Bully, Passion Flower, Bella Donna, Llamala. 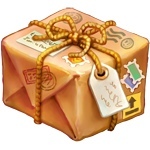 What items can be found in Packages? 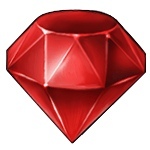 Coins, Experience, Mana, Wood, Stone, Magic Dust, Saw, Hammer, Shovel, Nails, Grapevines, Seeds, Agaric Mushrooms, Frogs, Bones, Clay, Premium Energy, Magic Watering Cans, Rubies, Magic XP, Kaya's Gems. What items can be found in Boxes? 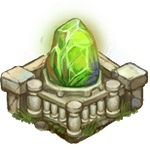 Coins, Experience, Wood, Stone, Magic Dust, Clay, Stone Fence, Wooden Fence, Green Hedges, Flower Hedge, White Fences, Spells, Dragon Treats, Premium Energy, Magic Watering Cans, Rubies, Magic XP. How do I open a new land expansion? Expansions are opened based on your Magic Level, not Experience Level. 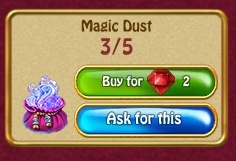 You need both the correct Magic Level and either Coins or Rubies to open each new land parcel. Where to find " Dawn Keys" and "Twilight Keys"? 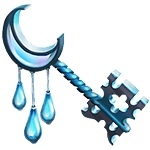 Dawn Keys and Twilight Keys can be bought in the Trading Tower. 12 Dawn Keys cost 30 Tokens of GD and 12 Twilight Keys cost 90 Tokens of GD. How can I get the quest "Beyond the Mists 1/3"? This quest will be available when you reach 30th level. There is a shop in the Trading Tower where you can buy various buildings, items and resources for GD Tokens. 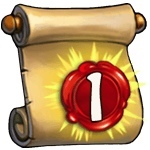 Besides, during the timed quests you can find limited items for completing these quests. What is Good Deeds Department? It is a special building that gives you challenging tasts every day. 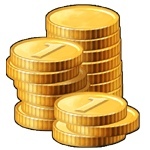 Completing these tasks gives you valuable resources and new game currency - Good Deeds Tokens. GDD is available for all players starting from 15 level. To get the primary quest “The Kindest Enchanter” make sure you have opened the Trading Tower. Then following the task, buy and put the GDD on your land. Now you can start the daily tasks! 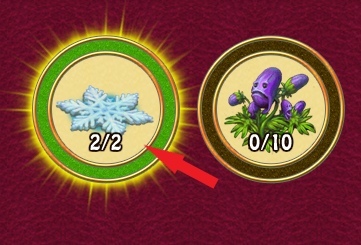 How can I get Good Deeds token and what can I spend it on? You can get the tokens by completing daily tasks in GDD. 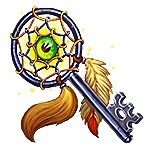 This is a special currency which you can spend in the Trading Tower on the Keys, decorations and other useful items. How to open the chests? When the circle is fully green, you need to click on it to get your reward. The reward is sent automatically at 00.00. Msk or the moment you complete the last task available for today. The new tasks are announced every day at 00.00 Msk time and you have 24h to complete them. Does the number of the chests depend on your level? Yes, of course! GDD’s tasks are open for all players starting from 15 level. © 2002-2019 Nevosoft. All rights reserved . All trademarks are the property of their respective owners.